The 2016 Lucky 7 Find is one of extreme significance. The discovered happened in February of 2016, just four years after the famous Black Swamp Find of 2012. It's the story collectors dream about. The story of rummaging through our great grandpa's things and stumbling across a small trove of epic discovery. In this case, 7 copies of the ultra rare Ty Cobb back T206 Ty Cobb cards were found face down in an old paper bag. These Ty Cobb back cards are even rarer than the famous T206 Honus Wagner, which is believed to have a print run of 60-70 copies. 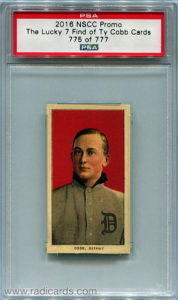 The addition of these 7 Ty Cobb back cards brings the total number known to exist to just 22 copies. It's finds like this that keep us intrigued over and again with each passing discovery even if they are becoming more rare each year. Appropriately dubbed, The Lucky 7 Find, this small collection holds an estimated combined total value of well into the 7 figures, which is a fitting number.2)Ty Cobb Baseball Card Trove Reignites Dreams of Shoebox Jackpots. www.nytimes.com While becoming exceedingly rare, it's finds like these that ignite interest in the hobby of sports card collecting. Upon discovery, the cards were sent to PSA to be graded. The grades include: 1x 1.5 (FR), 4x 2.5 (Good+), 1x 3.5 (VG+), and one astounding 4.5 (VG-EX+). The 3.5 and the 4.5 at the time of this writing represent the finest known examples in the hobby. This discovery represents the hope that finds like this still exist and there are still rarities to be found in odd and old places. VIP pass holders who attended the 2016 National Sports Collectors Convention had a chance to receive a special promotional example of the Ty Cobb card to commemorate this special find. Only 777 copies of the promotional example were printed.